We get this one pretty often where someone has a late model EFI GM truck with a 5.3L or a 5.7L small block that wants to make more power or be able to romp & stomp with big off-road tires. The reality is; you are REALLY limited in what you can do. Many times a guy will want a "lumpy" cam so it "sounds good". The problem is; a "lumpy" cam creates a low idle vacuum signal which makes the EFI system think you are on the throttle, so it shoots all kinds of fuel at it when it doesn't need it. This causes it to hunt and peck for an idle, it causes it to run really rich, and it makes it really sluggish on the bottom-end, right where you need all your power in a truck. A big cam may make more power BUT it makes more power ONLY at higher RPMs. The problem with a heavy truck and/or running big tires is gearing. You HAVE to have low gears when you run bigger cams & tires so you can get that truck moving and keep the RPM's up where it makes its power. The problem is; big tires make the gearing taller which makes it even harder to get that truck moving from 0-60 MPH or up into the RPMs where the "lumpy cam" makes its power. This is why you don't really see any late model trucks with big lumpy cams in them, not to mention GM EFI systems aren't really tunable, or at least not AS tunable as they need to be to support a big cam with a low vacuum signal. If you have a truck and you put a bigger cam in it and bigger tires, and you didn't lower the gear ratio... you just took TWO steps backwards for making it perform better. You've just created a turd that can't get out of its own way. Look at Diesel trucks. Most guys with big 4x4 Diesel's have huge tires, yet they can still lay-on the throttle and GO! This is because a Diesel engines makes BIG torque numbers. Torque is what moves that truck, not "horsepower". Typical Diesel trucks make in the 300 - 325 HP area, which isn;t much these days, BUT they make like 600 - 800 FT Lbs of raw, axle twisting torque. THAT is what moves those trucks! Big lumpy cams do NOT make low-end torque... at all, so sticking one in your truck engine is the complete opposite of what you want if you want it to have some get-up and go. The next issue is a big set of heads. It does NO good to put a big breathing set of heads on an engine if the intake system can't flow enough to utilize the better flowing heads. It's like installing 2" water pipes in your house when the feed line to the house is only 1". Those 2" pipes can NOT flow any more than what that 1" feed pipe can supply, period. This doesn't even get into the fact that larger valved / larger runner heads need more RPM to create the velocity needed for them to work. In other words, bigger heads mean more flow ONLY if the intake system can flow enough to supply those heads, and only if the engine can DO something with that flow and is able to work in the RPM that those heads flow best at. Low RPM's do NOT require big flow numbers. Making power at low RPMs requires "velocity", so "big" heads are not the answer and are another step backwards for a truck engine. So how about a bigger exhaust? Nope. On performance cars and race cars, what goes in must come out, but in heavy vehicles and trucks where they need torque, you NEED a certain amount of back pressure or you will lose all of your bottom-end torque. You don't see race cars with huge exhaust systems launching off the line or driving down the rack right off an idle. They launch close to the red line and hold it at red line all the way down the track. There's a reason for that. Now seriously, do you drive your truck that way? CAN you even drive your truck that way around town, while towing, or just playing in the dirt or mud? NO. You have to be able to GET going. That requires torque. So when you see a truck with 3" exhaust and loud Flowmasters on it, that guy just took a step backwards in performance. Just because it may "sound" good with a low - rumbly exhaust tone, doesn't mean it is going to perform good. So how about fresh air intake systems, headers, power pulleys and maybe a chip? Well let's figure on what that'll cost and what you'll get in return. You can spend $1,500 - $2,000 or more on stuff like this to make extra power, but how much extra power are you really going to make? Not nearly as much as what they advertise! With all of that, you MAY gain 30 - 40 HP overall (on a good day). If you want to see what 30 HP feels like, turn on your A/C system while you're driving down the freeway. You'll feel the truck lag a bit. Now turn it back off. That jump in power when you turn it off is what about 30 HP feels like. It ain't much. Well, 40 HP isn't that much more, and it isn't worth all of that $ to gain that little of power. 30 to 40 HP certainly won't turn your truck into any kind of a romper - stomper, that's for sure! This doesn't even get into the fact that things like "power pulleys" slow your accessories down. Well, now you have overheating issues in traffic because your fan speed is slower so it isn;t drawing as much air through the radiator as it used to, not to mention when you slow the alternator down, it has trouble charging at an idle so your headlights dim down when you are idling. Always remember; there is a give for every take. Again, you also have to look at WHERE that power comes-in at. Don't look at "horsepower", look at TORQUE. Torque is what moves that truck, period! Torque is what moves big tires and taller gear ratios. You don't see freight trains running down the tracks sounding like a race car, nor do you see 80,000 LB semi trucks running down the freeway with 1,000 HP Pro Stock engines in them revving at 8,000 RPM. A 2 stroke chain saw makes all kinds of HP and revs to 19,000 RPM, but as soon as the chain gets stuck and the RPMs drop, it bogs down and can't cut anymore. You have to free it up to get the revs back up again before you can continue cutting just like a race car will do if it doesn't launch off the rev limiter. This is because chain saws, and pretty much any 2 stroke gas engines, don't make any torque, and for good reason. You certainly wouldn't want to be cutting a tree down with a high torque chain saw because when the chain grabs and stops, the torque of the engine would throw you 20 feet and probably break your hands or arms. They WANT the saw to bog down as a safety feature. So why would you want to turn your truck into a chain saw? The only trucks you see romping & stomping with big tires and such are Diesel's and big blocks. Both of those make brutal low-end power and BIG TIME torque. Something you just won't get out of a small block, not a GM EFI small block anyway, and the more you try to make more "horsepower" with it, the more of a turd you are creating. A 400 HP Vette motor in a truck won't smoke the tires, but a 400 HP Diesel engine in one sure as hell will. Why? Because the Vette' motor only makes about 400 Ft. Lbs of torque, but the 400 HP Diesel engine makes about 800 Ft Lbs of torque, or more. So tell me, is it the horsepower making that truck move, or is it torque? It's torque! Shy of building a large cubic inch stroker small block and going with an after market, tunable EFI system specifically designed for making torque, you can't do much with your stock truck to gain a substantial amount of power to really make a difference OTHER than going with a power adder such as nitrous, a supercharger or a turbo. Turbos don't really work that well in trucks because when you are idling along and come-up against a tree stump that you need to blip the throttle to leap over, the turbo lag doesn't help you much, not to mention turbos are expensive and difficult to install being that they involve the exhaust system. A nitrous system is fun but when it runs out, you're dead in the water, not to mention it is only there as long as you have it armed, ready, and are using it. An average bottle only lasts about 20 - 30 seconds worth of time (on average for a small shot of power such as 75 - 100 HP), so it isn't a very good choice for a truck. 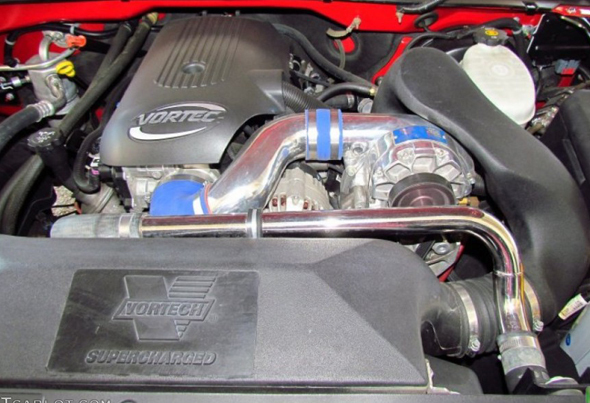 The only good power adder that is worth the money, is easy to install, and that'll give you a decent amount of power, (including torque) while utilizing all of the stock engine system, is a centrifugal supercharger such as a Vortech. You can expect anywhere from 80 to 150 HP from one, and most of all, you can expect about that much more gain in raw, low-end torque! The only down side to one of these is the cost. An average bolt-on kit can run between $3,000 and $4,000, but it is worth it if you want to stay with a small block and still have your EFI system, fuel mileage, drivability, and make gobs of torque and power. If you want to learn more about this kind of stuff, in much greater detail, be sure to check out our Auto Shop Videos series by clicking HERE. We have one titled "Superchargers" that covers all of this kind of stuff and MUCH more. These make great Christmas, Father's Day and Birthday gifts!